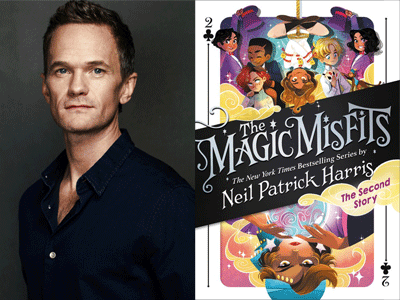 *Each ticket includes a pre-signed copy of The Magic Misfits: The Second Story and one raffle ticket entry into a drawing for an exclusive VIP meet-and-greet with Neil Patrick Harris immediately following the event. The author will choose five lucky readers (each with a +1) for a meet-and-greet to snap photos and have their books personalized. Purchasing for a family of 4 or more? Use the discount code FAMILY4 for 25% off! Enjoy an exciting evening of magic and conversation with award-winning actor Neil Patrick Harris! All this in celebration of the second book in his New York Times-bestselling series: The Magic Misfits: The Second Story. Neil Patrick Harris is a Tony and Emmy award-winning stage and screen performer, famous for his roles as Barney Stinson in How I Met Your Mother, Count Olaf in A Series of Unfortunate Events and as the iconic and beloved Doogie Howser, M.D. He’s been in many movies, hosted both the Tony and the Emmy Awards multiple times, performed in several Broadway shows and is an accomplished amateur magician on the side. He is also the father of twins. Made possible through the generous support of Marcia and John Goldman.